I LOVE this system!!! Just made my 3 months worth of food. It couldn’t be simpler, and I feel good knowing my baby is getting fresh and nutritious food. THANK YOU!!! A terrific resource for both new and experienced parents who want to encourage healthy eating from an early age. 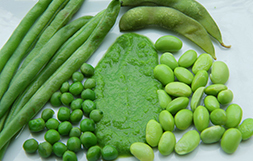 An excellent resource for any parent who wants to make their child’s first foods. An easy and informative manual to help make introducing solids a delicious and healthy start to a lifetime of good eating. 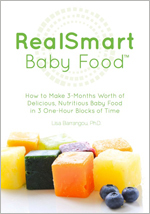 Lisa Barrangou, Ph.D. is the author of The Amazing Make-Ahead Baby Food Book. 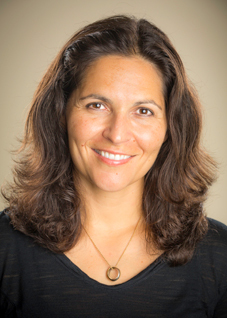 Dr. Barrangou is an experienced mother, food professional, food enthusiast, and advocate for healthy living. She previously created a homemade baby food company, Green Baby Chef, offering personal chef services for infants, as well as private cooking instruction and baby food making workshops. She holds a B.S. in Nutrition, Food and Agriculture from Cornell University, and an M.S. and Ph.D. in Food Science from North Carolina State University. As a food scientist who previously worked for three different Fortune 500 food companies, she knows first hand what processed food truly is. When she had her first child, she knew that homemade baby food, made from whole, real foods, with no additives or fillers, would be her baby’s primary food source. She has been making homemade baby food since 2005, for each of her 3 children, her friends’ children, and for clients. Through her homemade baby food service company, Dr. Barrangou developed an efficient system to create 3 months worth of baby food within 3 hours, all safely made in her clients’ kitchen, conveniently packaged and compactly stored in their freezer, taking up no more space than a small basket. After realizing how many parents wanted to learn how to make baby food and use this efficient system for themselves, she integrated her knowledge and technique into a comprehensive baby food plan that became her first book, RealSmart Baby Food (2013). 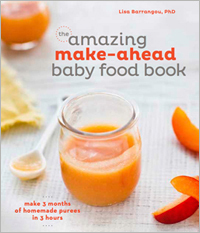 After much success, the first book was completely revamped and optimized, incorporating updated information, new and more advanced recipes, as well as all new vibrant photos, and turned into the current book The Amazing Make-Ahead Baby Food Book (2015). Copyright © 2019 The Amazing Make-Ahead Baby FoodBook. All rights reserved.